RTCA Inc, (Radio Technical Commission for Aeronautics) Washington, DC, is a non-profit corporation that functions as a Federal Advisory Committee to the Federal Aviation Administration (FAA). Its recommendations serve as the basis for policy, program and regulatory decisions. Sub-committee SC-135 produces the RTCA/DO-160E document titled Environmental Conditions and Test Procedures for Airborne Equipment. This document defines the test conditions and procedures for testing airborne equipment and is the standard by which Boeing, Airbus and other manufacturers require avionic components and sub-systems to be tested. Section 16, Power Input, includes new tests to address the issues of AC Harmonic Distortion and Variable Frequency AC Power Systems. Section 16.5.1.8 defines the AC Voltage distortion test requirements. Section 16.7.1.2 defines the AC Current distortion test requirements. These requirements cover both Single Phase and Three Phase equipment. Voltage and current measurements and harmonic analysis for each phase must be performed. Aircraft electrical systems are defined in three categories. A(CF) designates Constant Frequency 400 Hz AC power system. A(NF) is the Narrow Variable Frequency AC power system with a frequency range of 360 to 650 Hz. A(WF) designates the Wide Variable Frequency AC power system with a frequency range of 360 to 800 Hz. These tests require the measurement of the current and voltage harmonic components of magnitude and phase (optional) over the frequency band. DO160E requires harmonic analysis over 40 orders from the fundamental frequency. Requirements from Boeing and Airbus may require harmonic analysis out to 50 orders. 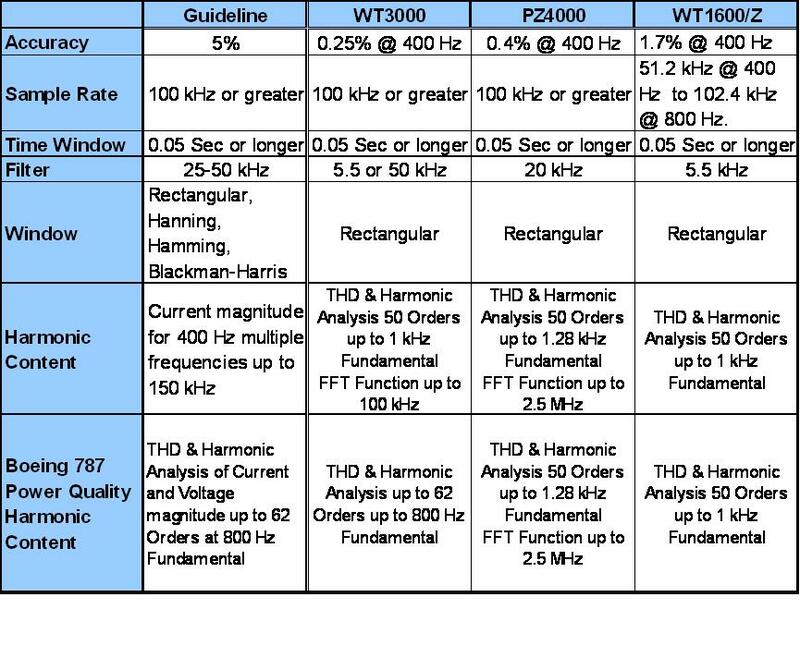 The latest standard from Boeing, B787 Power Quality Specifications, requires harmonic analysis out to 62 orders from a fundamental frequency up to 800 Hz. Certain requirements by Boeing and Airbus may require looking at the harmonic spectrum out to 150 kHz. The Yokogawa precision Power Analyzers provide an excellent solution for making the required Voltage and Current measurements and harmonic analysis of magnitude and phase for each harmonic order. The WT3000, PZ4000 and WT1600/Z are capable of making THD and Harmonic Analysis up to 50 orders on fundamental frequencies of 800 Hz and higher. Measurement accuracy and analysis functions meet or exceed the requirements outlined by the DO-160E test standard. 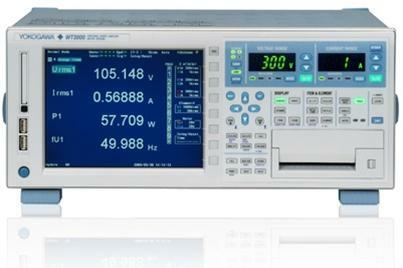 Analysis capability up to 62 orders on an 800 Hz fundamental are available with Yokogawa’s Model WT3000 Power Analyzer. The Power Analyzer can provide complete power measurement functions on the avionic component, as required by DO-160E, such as the Voltage, Current, Real Power (W), Apparent Power (VA) Reactive Power (VAR), Power Factor and efficiency, over the operating frequency of the aircraft power system. The advantage of using the Power Analyzer is that both AC Power and Harmonic Analysis functions can be performed in one instrument. Also the Power Analyzer is designed for making high accuracy Current measurements which cannot easily be done with other types of harmonic analysis instruments. Yokogawa can also provide precision high frequency Current Transformers with a wide band frequency response out to 150 kHz for applications requiring high current measurements. Harmonic magnitude values for both Voltage and Current must be measured, and the Total Harmonic Distortion (THD) calculated, as well as the Individual Harmonic Content (Harmonic Distortion Factor %hdf) expressed as percentage of the fundamental. The Yokogawa Power Analyzers provide a numeric data display of each of the harmonic orders with magnitude and %hdf measurements. 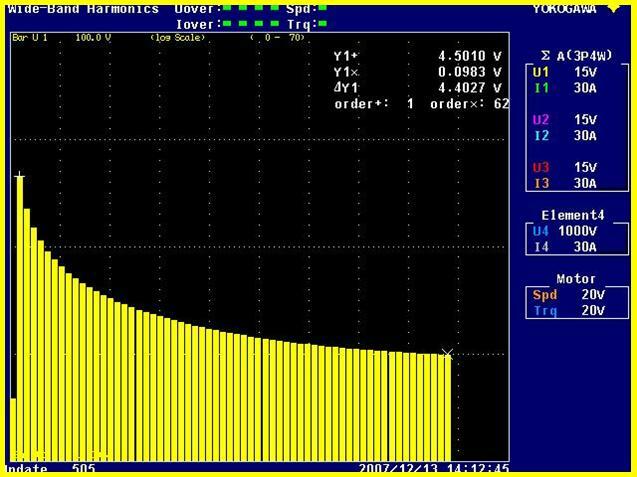 Sample Numeric Display of the harmonic Voltage magnitudes and Individual Harmonic Content (hdf%) for each harmonic order out to 62 orders. The below table provides a brief outline of the DO-160E requirements and the solution provided by the various Yokogawa Power Analyzers. You must choose the proper type of test instrumentation to make accurate Current, Voltage and Power measurements, and AC Harmonic Distortion analysis on aircraft electrical systems and equipment, as defined by DO-160E, Airbus ABD0100.1.8, and Boeing B787 Power Quality Specifications. All service performed at factory headquarters in Newnan (Atlanta) Georgia.